Add a piece of comfortable and stylish seating to a living room, bedroom, dorm room or den with the roomy Big Joe Milano Bean Bag Chair. The exterior is constructed of soft, yet durable faux leather. The fill is made of Megahh Beans, which are designed to conform to the body. This 32&quot; x 28&quot; x 25&quot; Big Joe chair is double-stitched for enhanced durability and features a double safety locking zipper for added strength and safety. It's built with a handle for ease of maneuverability. 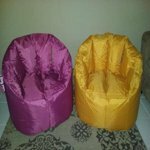 With a contemporary look and cozy feel, the Big Joe bean bag chair is suitable for use when reading, gaming, watching television or relaxing. It's available in multiple colors and is easy to care for. Add a piece of comfortable and stylish seating to a living room, bedroom, dorm room or den with the roomy Big Joe Milano Bean Bag Chair. The exterior is constructed of soft, yet durable faux leather. The fill is made of Megahh Beans, which are designed to conform to the body. This 32" x 28" x 25" Big Joe chair is double-stitched for enhanced durability and features a double safety locking zipper for added strength and safety. It's built with a handle for ease of maneuverability. 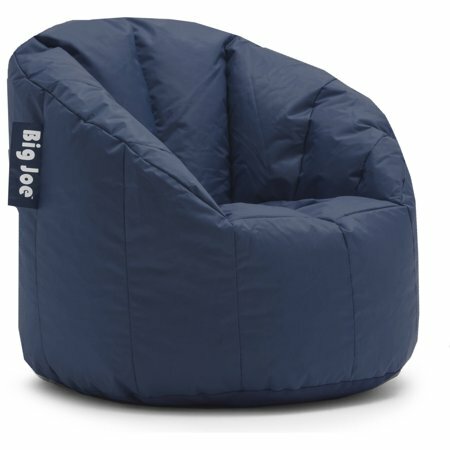 With a contemporary look and cozy feel, the Big Joe bean bag chair is suitable for use when reading, gaming, watching television or relaxing. It's available in multiple colors and is easy to care for. Great Price - Great Product for Kids! It's structured, but much lighter than I thought - our 2yr-old nephew will be able to drag this all over the house :) It was the hit of the Christmas party! 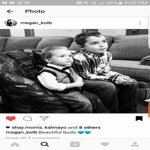 In the picture, he is sitting with his 8yr-old cousin. I wish it came in more prints for the girls - LOVE! It's very comfortable. We bought a green and a grey one. My kids love it. We have them in our rec room. The boys jump on them and it stills holding up. I am sure with time it will shrink down and I will fill it with styrofoam beans then and is still cost effective. The price and quality is unbeatable. I will surely go for other products but them. I recommend this product to two of my friends who have bought it too and enjoy it aswell. 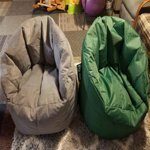 I consider the use that we put the bean bag seat to moderately hard usage and a gentle use and is great.Wish the grey one was made of the same material as the green one. Since we have small kids we have a few stains on it. I use water to clean both and the green one easier to clean. Overall it's a great purchase. I am pleasantly surprised at how well made, comfortable, durable and good looking these chairs are. Everyone from my 70lb 10 year old to my 180lb husband seems comfortable in these chairs. They are way better looking than regular bean bag chairs, which tend to look sloppy. The fabric is super durable and wipes clean easily. You can't beat Walmart's price. These chairs were more than double everywhere else I looked. I would have given them 5 stars, except that I ordered 3 of them, and they were all a different density, like they weren't filled with the same amount of beans, or something. Wish they were all like the fullest, firmest one. 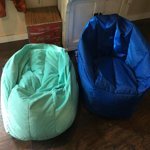 Over all, I highly recommend the Big Joe Bean Bag Chairs for any rec. space, kid's space, or casual lounge space. 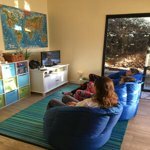 I bought two bean bag chairs for my children for Christmas. You can probably find the review I've already posted on WalMart. Long story short - The chairs have already started to collapse, after only 17 days of use. Maybe you think my kids are big and burly and that's the reason why - well, my youngest weighs about 37# and my oldest weighs about 68#. Neither my husband nor I use the chairs, so this collapse has happened in less than 3 weeks due to normal use by young, small children. Refills are about $25 - $30 per bag and it takes at least 1.5 bags to refill. For that price, I could buy new chairs and combine the fillings when the chairs begins to collapse!! What a disappointment. You can compare the store's picture to my picture... This is what happened after 17 DAYS of normal use. 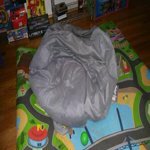 Purchased this bean bag to accompany one my son recieved for christmas. My sons is the same style, however his is in a wind breaker type, Nylon material. This one is made out of a velvet soft fabric. The reason that is important is because this one WILL NOT hold its shape and has since basically deflated into a sunken pile of nothing. 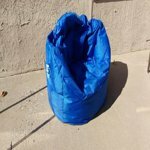 The bean bag chair we have in the Nylon material is perfectly shaped and still completely functional. I would recommend the bean bag chair in this style but with a different outer material. Something more sturdy. This particular one will not hold up and will be useless after 1-2 months time The two bean bag chairs ive referred to have been used equally in the same amount of time. Bought this for Christmas 2017 for my 12yo son. Depsite it being stuffed tight at purchase it was significantly deflated within 2 weeks. Contacted the manufacturer a few minths later. They sent out 2 complimentary boxes of refill, but the chair still deflated quickly. Dont understand how the âbeansâ can turn flat-as-a-pancake so quickly. This chair is a joke. Thing was nothing but a flat pancake 3 weeks in. My son is 9 and slender. Only sat in it a couple hours in the evening when gaming. No other time. Eont even sit up anymore like a chair and instead is like a conforter on the floor. The box was sturdier than it came in. Dont wastebyour money. Pure junk waste of money. So disappointed!! 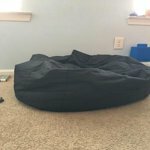 Bought this bean bag chair for my 4 and 7yr old and we have had it for a little over a month and its completely flat. They didnt even sit on it everyday.